Every time Livingsoft releases a seasonal pattern collection, support is added for some new style or fashion trend that has proven popular that season. These new patterns often provide the basis for major new design enhancements that get incorporated into all patterns in the Dress Shop catalog. At least one of the new patterns developed for The Winter 2011 Collection has already made that leap - with this update. 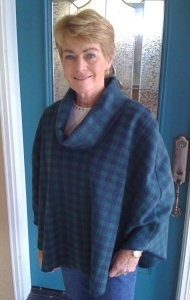 If you look under "Outerwear - Capes and Ponchos", you should see the new "Cloak" category there with the usual variety of closure, necklines, and collar options. Be sure to check the "Options - Shaping and Finish" dialog for armhole and shaping options. Ah... The Winter 2011 Collection … we had so much Fun with this. Capes, cloaks and ponchos with various closures and options, mock sleeves that are called cape sleeves, long and luxurious with open side seams, welt openings for hands, short and trippy ponchos. 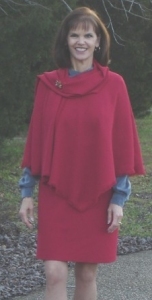 For the classic city evening wear try an opera cape with a hood and velvet ties… oh fun, fun, fun. I fell hard for the Cape Sleeve cape and invested some in this black cashmere knit ( yes- it does feel Yummy) with long hair faux fur trim. It was fun taking pictures out at Ravella’s Fountain at Lake Las Vegas early on Thanksgiving morning. Includes hood to protect your hair as well. Has a shoulder line built in to provide a closer, more dressy look than the simpler capes. 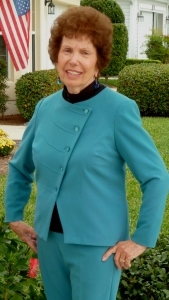 Is narrower and has less hemline curve than a cape as well. 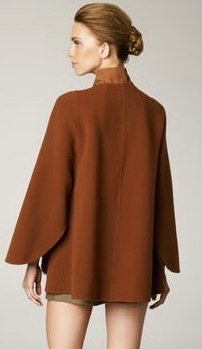 The Cape Sleeve Cape has mock sleeves and you can handle this any way you wish. Sew the shoulder and over arm sleeve seam down to the sleeve point. Then you have the option of sewing the side sleeve below the sleeve hem down to the cape hem or leaving it open. The Cape may be fully lined, trimmed, or use the facings. You will also find a single line which mocks the sleeve's connecting point to the body of the cape. This can be ignored, stitched, or even slashed open with finished raw edges. Linings! Several of the new capes and cloaks in this collection needed linings and those were currently only being offered with jackets. You can now add linings to almost any vest, cape, cloak, or other outerwear that might need them. Vests with points currently do not yet have lining support, but almost any other outerwear does. See "Options - Shaping and Finish" to select them. The curved center front of the bolero pattern has spawned a number of variations and we decided to include several of those in this new collection. The standard Bolero can be the classic Matador length (Above Waist) as well as waist length and ab length. 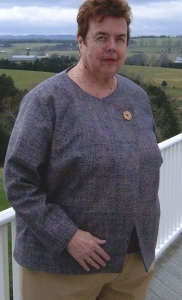 The 2-Button Bolero pictured at left can be up to inseam length. Be sure to check the Advanced Closure settings for adjustments to the shape of the jacket front. You can make an incredible variety of shapes using the Bolero settings in that dialog. This new jacket has a buttoned overlap at the top, angling down to an open front at the bottom. 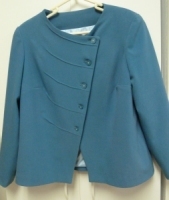 This elegant jacket makes a stylish statement with a simple, easy to make design. Ponchos are just plain sheer fun and possibly the simplest pattern to cut and sew in entire Dress Shop catalog. But, add a collar and with the right fabric, you can get a great pull-over. Nancy did the Turtleneck Poncho while Luz's Poncho has a separate scarf rather than the turtleneck. The problem with yokes for skirts has always been that the shaping needed between the waist and the hip can sometimes be too much for the side seam of a short yoke. The angle of the side seam is just too extreme and hard to sew. With these new yoked skirt patterns, we added darting to the yoke piece so you can get yoke look but still have darts to provide the shaping and fit you might need. You can also add extra width below the yoke for pleating or gathers and get a great variety of looks from this simple new design element. There are many more patterns in this exciting new collection, so do come by the Livingsoft web site and check out more customer photos of what is included. Click here to see more! The Fur Vest pattern included in The Winter 2011 Collection is incredibly simple with just two shoulder seams and 2 side seams, optional linings, hem and done. But, if you do make one with fur or if you use fur with any jacket, cape, cloak, or other outerwear, there are some things to be taken into consideration. 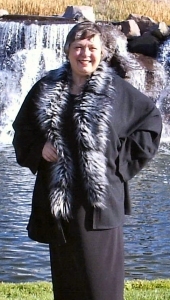 The Fur Vest was designed with some extra room due to the density of the “fabric”. You will see that an allowance for a shoulder pad is in the pattern. We don’t expect you to use the shoulder pad, but it was a quick easy way to add extra space due to the density of the fur. A few faux fur sewing tips: If planning on using fur for trim or the body of your garment, know that fur with a knit backing can be torn rather than cut, greatly reducing the damage and loss of “hairs”. The trick is to minimize the amount of damaged “hairs” while cutting. Lay your pattern out on the wrong side of the fur, and chalk the outline. Use just the tips of your scissors and cut through only the knit backing leaving the hairs undamaged on the right side. If at all possible cut outside the house or in the garage to minimize the cleanup! Inside keep your vacuum cleaner handy! An electric shaver can shave off the fur hairs in the seam allowance and reduce the bulk under the machine needle. Check your presser foot tension if you can, and lengthen your stitch length at least 1 notch. Real fur pelts take some extra grooming and effort. 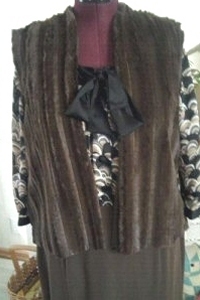 To line faux fur cut the lining a scant 1/8th inch smaller than the fashion piece. This will pull the edge towards the lining and keep it tight and secure. Fur Hooks available by Dritz and others are wonderful closures if desired. They disappear into the hair and are a great substitute for buttons. To see more customer photos from this collection, or to purchase, please click here. Dress Shop Upgrade Discounts Extended! The Winter 2011 collection (and all other Dress Shop collections to come in the future) require ownership of Dress Shop 8 or later. Owners of Dress Shop versions prior to version 8 will need to upgrade to continue receiving program enhancements, new collections, and new patterns in the future. Livingsoft has had a number of inquiries in the past few days regarding the upgrade discount offer. To avoid contributing to holiday stress and rush, we are extending the upgrade offers through December 31, 2011. This will be the last chance for these upgrade rates, though, so do check them out before they expire. Click here to see what comes with an upgrade. Upgrade Dress Shop 4, 5, 6, 7, or 8 Standard to Dress Shop 9 Standard for just $50! Upgrade any non-Pro version of Dress Shop to Dress Shop 9 Pro for $200! Upgrade any version of Dress Shop Pro whatsoever to Dress Shop 9 Pro for $50! Half Price For Winters Past! To keep the LivingsoftNW web site somewhat tidy, we have been removing older collections as new ones are released. At any given time, only the most recent 4 seasonal collections are being offered. Those older collections are not necessarily dated and useless, though. The prior Winter Collections have some creative designer coat, jackets, dress, and blouse patterns in them, so we will occasionally bring one back for a limited time release. Through January 15, 2012, the Winter 2008 and Winter 2010 Collections are back and available at 50% off. For a limited time only $25! For a limited time only $30!